Karber's Blog: Karber DT call! Hi again crafty friends! We are having a DT call! Enjoy working with digital stamps. Create at least 4 cards per month. The DT term is for three months. Add 3 links of some of your cards. Do not attach pictures, just the links. 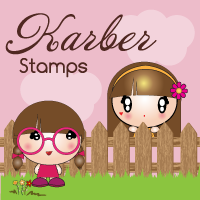 Tell us why you like Karber Digital Stamps? Applications will be accepted until August 18th 2012!